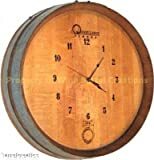 Keep time while you're sipping wine with this cool new Wine Barrel Head Wall Clock. 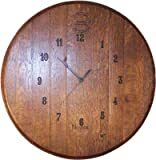 This rustic wall clock is handcrafted by skilled artisan woodworkers from an authentic reclaimed red wine barrel from the Napa valley wine country. Each barrel head is preserved in its natural state with its distinctive color, scent, and grain pattern, making each clock truly unique. Each clock features accurate quartz movement, large engraved Roman numerals, and a metal barrel band. 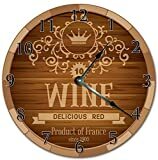 Makes a great gift for wine lovers and a perfect addition to any proper wine cellar.